"The Lies" begins to unite both Wonder Woman and Cheetah's story with the subplot of Steve Trevor and his unit in the jungles of Bwunda. Wonder Woman and Cheetah's trek through the jungle into the home of the bloodthirsty god Urzkartaga leads them to discover the captured soldiers... although the jungle deity's plans for Trevor mean we'll have to wait at least until one more issue before his reunion with Diana. 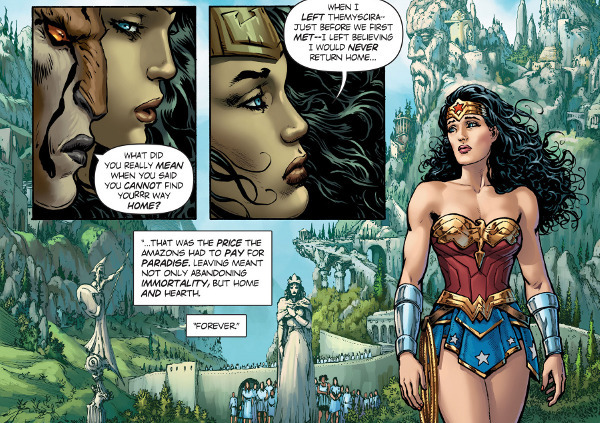 The comic also features a new subplot thousands of miles away concerning an unknown entity's interest in Wonder Woman and her reunion with Trevor. Taking up a few too many pages while teasing us with information the comic has no intention of sharing just yet, the subplot slows down both Wonder Woman and Trevor's individual tales. Of course, this allows the issue to end on a cliffhanger. My other complaint with the issue is the art of Liam Sharp whose version of the Amazon princess works fine for me in action scenes but not quite as well in her more contemplative moments when not fighting odd werewolf creatures. For fans.